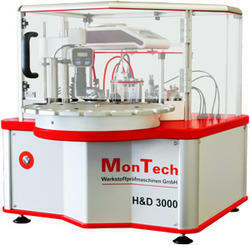 2 instruments in 1: With the MonTech H&D 3000, hardness AND density testing of cured rubber samples is made simple, fast and reliable. Arbitrary test sequences are easily pre-programmed, samples are sequentially processed and test data is automatically collected, without the need for operator involvement. Due to the unique rotary tray design, no manual magazine handling is needed; the instrument can be continuously loaded and operated.